In Hindi, the language of North India, khel means “to play.” KHEL stands for kindness, health, education, and laughter. We consider these essentials of childhood. KHEL Charities is a non-profit, secular organization based in Dehradun, the state capital of Uttarakhand (previously called Uttaranchal) in northern India. We provide equal opportunity education, support and employment, regardless of race, gender, or religious affiliation. KHEL promotes the ideals of non-violence, tolerance and respect. We believe that it is only through one’s own efforts that success is possible. Therefore, while we do provide basic needs to communities, our focus is supporting local business ventures, and most importantly, educating impoverished children. KHEL gives future generations the necessary tools to improve their lives. There is a growing awareness of significant interdependence of global and cultural regions. Poverty is a problem that affects everyone. India is experiencing increased economic productivity, but often this results in poor working conditions and child labor. We at KHEL feel that social responsibility is a necessary part of life, and we have seen encouraging changes in communities we serve. There is an urgent need for education to combat overpopulation, poverty and disease. 20 per cent of children aged 6 to14 are still not in school. Several problems persist; issues of ‘social distance’ arising out of caste, class and gender differences deny children equal opportunities. KHEL’s primary goal is to help communities become independent of charity. KHEL provides employment to those who want to contribute to positive change. We are committed to hiring from within the areas we serve. Over 90 per cent of our employees come from this community. Many of our staff are former KHEL students who decide to return to offer their help. Just as the young people of KHEL grow up to become our teachers and managers, KHEL’s Founders’ children now provide the bulk of the administrative, fund raising and long-term planning duties. My father was originally from India and my mother of Indian descent. She grew up on the edge of the Amazonian Rainforest in Guyana, South America. I was born and raised in Minneapolis, Minnesota, USA. Although we called our mom “Ammaji” (Hindi for mother) I had little direct experience of India until 1981, when we relocated to my father’s hometown in the Himalayan foothills. Dehradun was not the industrious city it is today; rather a sleepy settlement sprawled in the lush shadow of the mountains. Cows napped in the streets, grandly indifferent to passing cars, and the electricity was surprising only when it worked. The nearest international long-distance phone was a six-hour drive. Everything was an adventure. In the early morning, a milkman would come to our gate, appearing out of the mist with his clanking bucket. Having only seen milk come out of cartons, I was delighted by this, and liked to run out after Ammaji to watch him transfer the milk into our kitchen jug. One day, when he was pouring the milk, a neighborhood urchin was passing by and stopped, watching us with a puzzled look. By this point, we had gotten used to seeing street children, scraping for food, stealing what they could, begging for spare change. They were huddled at every corner, clad in torn and dirty clothes, tiny hands held out in entreaty. We would give them a little money and go about our day. They were just another part of our new life in India. This scrawny little boy paused and asked, “What’s that white stuff?” I was shocked that he had never seen, much less tasted, milk. Wasn’t it one of the basics of childhood? My mother sent me to get a cup from the house, silently poured the fresh, frothy milk and held it out. After a first cautious taste, he downed it in one ravenous gulp, and solemnly handed the tin cup back. We stood in silence, uncertain. Suddenly his grimy face lit with a huge grin, bright as a kid at Christmas, thrilled at having had a simple glass of milk, offered with kindness. After he ran off, my mother took the milk jug inside and cried. I will never forget that child’s smile. The smile that broke our hearts and changed our lives. She began with a pint of milk a day. Word of the free milk spread rapidly and soon a horde of hungry children were turning up every morning, looking for something to put in their empty bellies before going off to beg in the streets. Many of them were the children of leprosy patients, people too handicapped to work, shunned by society. All the children were illiterate, filthy and malnourished. Ammaji couldn’t bring herself to turn them away. As our household budget strained under escalating gallons of milk, friends sent money to help. We began to see a difference; the children put on healthy weight and became more alert and active. My mother realized that feeding kids helped, but it didn’t fix the problem. Charity can only postpone a bleak future. Hungry children need more than charity, they need change. They need faith that one day they will provide their own meals. They need education. Under a shade tree in a slum, she started teaching children to read. My brother and I would go with and play with them. Sometimes we would have to beg parents to send their kids; but what do you do when you are crippled by leprosy and the income from your child’s begging is all you have? 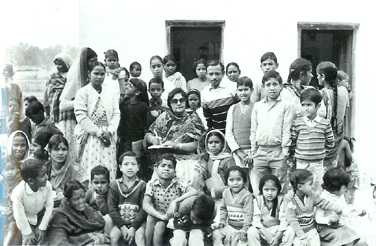 Ammaji began to raise money to support basic needs so the children had “free time” to attend classes. My mother begged from our friends so that the children need not beg from strangers. As need for support grew, and donations began to come from around the world, we attained non-profit status, began building a school, and KHEL was born. Today, the organization my mother began by giving milk to one child supports a government-recognized school with about 300 students in preschool through 8th grade. In addition to education, we provide basic needs, host medical camps and support two leprosy colonies. We have 20 employees most of whom come from the same community as the children. KHEL has built homes, community centers and medical dispensaries, as well as implemented clean water, drainage and sanitary facilities. Through the recent addition of an Adolescent Resource Centre funded by Dhyana Mandiram Trust, we have begun to provide a comprehensive training program for our kids, with doctor visits, counseling, and participatory activities to educate them about health, hygiene, interpersonal relationships and career planning. With my mother now acting in an advisory role, and with the invaluable support of donors, friends and family, my sister, Stomya Persaud, is KHEL’s volunteer Executive Director. Other members of our family are active in a variety of roles such as IT, hands on volunteering and fund raising. KHEL has defined my family. Running it continues to be a mixture of pride, humility, exasperation and joy. When people say you can’t make a difference, it’s because they haven’t tried. We started with a battered tin cup of milk held out in kindness. We started with hope.